The story of the famous American brand lingers since early 20 th century. It was then when restless an already renowned worldwide Henry Ford launched yet another line of automobiles. It happened in a glorious city of Detroit. New car was called named after a military explorer, Marquis Antoine de Cadillac. French national, he managed a lot of things in his life: do time in the Bastille, explore Canadian land, and serve some kings. It is anyone’s guess which of this merits earned the outstanding man the honor of being perpetuated in the vehicle brand. 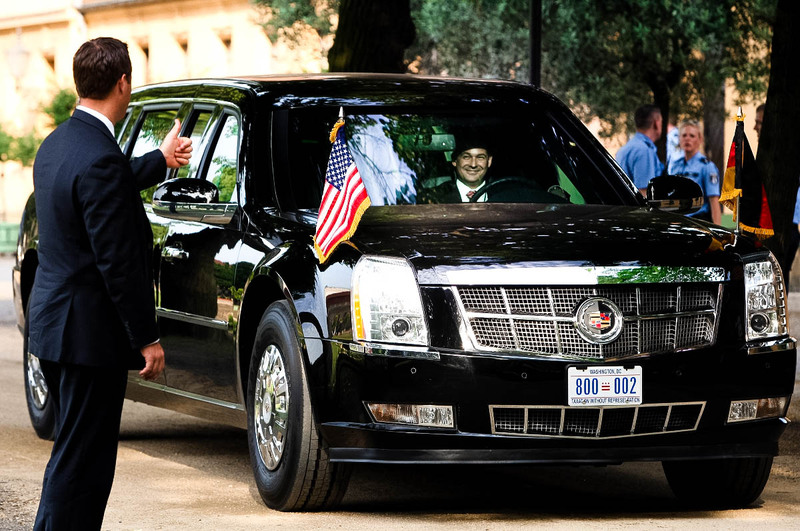 The first President of the USA to mount a “Cadillac” was Woodrow Wilson. After that American leaders were swinging between different carmakers like a pendulum. However, year 1933 set the record straight once and for all. And White House car parks have since then and till now been filled exclusively with luxury cars by General Motors. Once during his visit to Chicago Franklin Roosevelt together with the city’s mayor was driving along the streets. Their cortege was attacked: the president survived however the mayor died of gunshot wounds. Right after the incident security service started looking for the safest car for the state’s top figures. In the aftermath of tests and verifications Franklin Roosevelt solemnly change the automobile for… the confiscated “Cadillac” of Al Capone himself! And the vehicle was in no way inferior to the ones in modern James Bond movies. Fancy that: back seat could be turned to into a machine gun installation if required! Since that the already familiar brand definitively established itself as an attribute of power and fame. Next to American presidents, these cars were bought by Elvis Presley, Salvador Dali and modern movies stars, among them Nicholas Cage and Matt Damon. Speaking of that, the abovementioned genius of surrealism drew and gave the company a number of sketches that were reflected in designs of new vehicle models afterwards. Even Italians took a chance on ornamenting the legend of American automotive industry with their own charm. 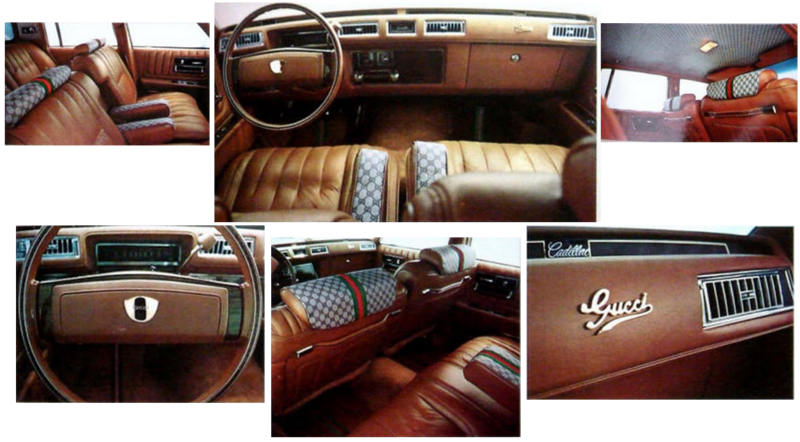 In 1979 “Cadillac” “Gucci Seville” came into the world. It was a limited edition of only 200 cars. A white car was decorated with GG everywhere outside while inside it was upholstered with striped green, red and beige fabric. The word is, the offspring of Italian fashion house enjoyed greatest popularity in California – mostly, due to its climate, of course. There the owners of a car decorated with light-colored fabric didn’t have to worry that the cabriolet would suffer from rain. The éclat of the vehicle reached outside America as early as in 1970s. 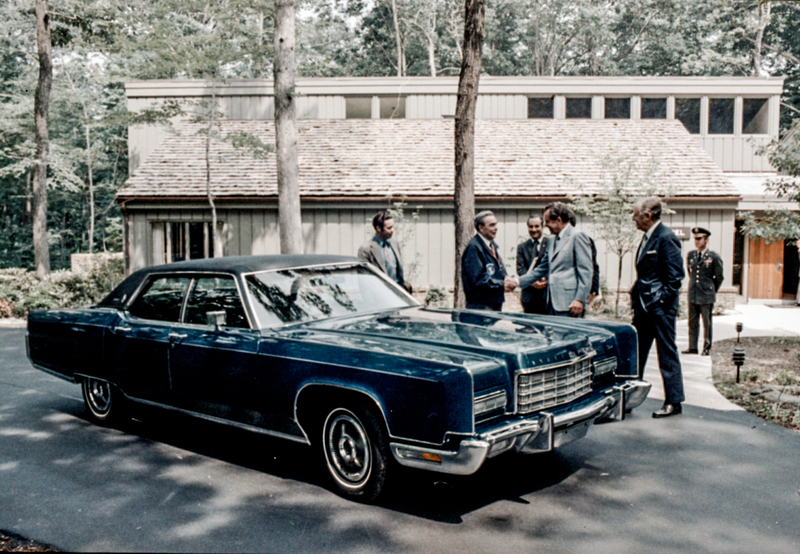 Soviet foreign ministers and diplomats were dropping subtle hints that mister Brezhnev is really keen on “Cadillac”. Naturally, visitors were never coming empty-handed. Therefore, “our dearest Leonid Illich” had a number of famous cars in his personal garage and he used to drive them along the streets of Moscow. Rumors has it that once the Secretary General gave a ride to American politician Henry Kissinger at an outrageous speed. After that the diplomat lost his affection towards “Cadillac”. In XXI century when not only impressive exterior but also a modern “filling” matters for an auto, our hero brand is no way at the tail end. These cars remain luxurious and popular. Wealthy people keep buying them. And those who strive for social inclusion to the upper crust or the USA presidency… well, they may start picking a model that agrees with really high-profile persons.